Iran is "acting with impunity, that deal emboldened them," Roskam said. "This is an unmasking of that. Unfortunately it's all too predictable. Give a malevolent regime huge amounts of cash with no restraining influence and this is what happens." The Trump Justice Department announced last week it had arrested two Iranians and charged them with spying on behalf of the hardline regime, a discovery that has refocused attention on the Islamic Republic's global spy operations. Lawmakers and experts have been warning for some time that Iran has stationed what some described as "sleeper cell" agents across the United States. These agents are believed to operate with impunity and could lay the groundwork for a large-scale terror attack on American soil. The two Iranian individuals—identified as Ahmadreza Mohammadi-Doostdar, a dual U.S.-Iranian citizen, and Majid Ghorbani, an Iranian citizen and resident of California—were formally charged by the Trump administration "with allegedly acting on behalf of the government of the Islamic Republic of Iran by conducting covert surveillance of Israeli and Jewish facilities in the United States, and collecting identifying information about American citizens and U.S. nationals who are members of the group Mujahedin-e Khalq (MEK)," an Iranian opposition group that promotes regime change in the Islamic Republic, the DOJ announced. One U.S. official, agreeing with Roskam's assessment, told the Free Beacon Iran has been running "vast espionage and information operations in the United States" with virtual impunity. The arrest of the two recently charged Iranians denotes a significant shift in policy that could result in the capture of more agents. "If there's anything that's become obvious in the last few months, it's that the Iranians are running vast espionage and information operations in the United States," said the source, who could only discuss the situation on background. "The Trump administration has been warning since day one that some of the windfall Iran got from the nuclear deal has been going into malign cyber operations." "The propaganda network that Facebook, Twitter, and YouTube uncovered was doubling as a hacking network that had been ramping up in the last couple of years," the source said, referring the recent uncovering of a massive social media influence campaign believed to be organized by Iran. Sen. Marco Rubio (R., Fla.), also a vocal critic of the Iranian regime, told the Free Beacon the recent arrest of the two Iranians is cause for major concern. "I am deeply alarmed by the Justice Department's new indictment against alleged Iranian agents," Rubio said. "Iran's regime has sponsored terrorist attacks against Americans abroad and our allies, and may now be seeking to target American citizens, as well as Jewish or Israeli facilities, on U.S. soil." 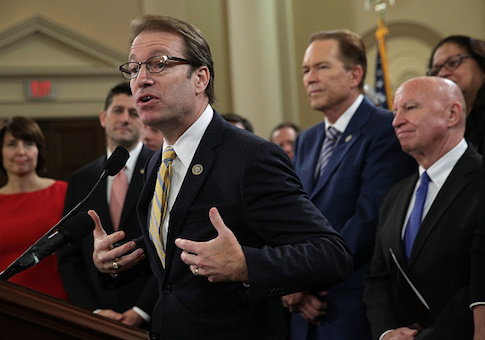 Roskam, in his comment to the Free Beacon, noted that "Iran's malevolence" toward Israel and other countries it considers an enemy is well documented. "What's new here is a level of aggression against the United States and an impunity with which they're operating," the lawmaker said, referring to the spy operations on Jewish targets—a cornerstone of Iran's global terror operations, particularly its 1994 bombing of a Jewish facility in Argentina that sent shockwaves through the global Jewish community. The operations on U.S. soil are "incredibly provocative and an indication where the Iranian regime is," Roskam said. Iran has publicly stated multiple times over the past years that it has a vast espionage network that includes the United States. While many have dismissed these claims as posturing, Roskam said Iran should be taken at its word. "The takeaway is we can take the Iranians at face value," he said. "They were declarative during the Iran negotiations: They were not willing to make any commitments as it relates to their state sponsorship of terror. It's clear they haven't. This can't be a surprise to anyone. It is entirely consistent with what they've been communicating. The surprise is the idea anyone thought they were slowing down or giving up their aggressive disposition." Congress will play a prominent role in investigating the matter in the months to come. This will include working with federal law enforcement to ensure Iranian agents are not able to coordinate terror attacks on Jewish or Israeli facilities. Earlier this year, Congress heard testimony from a panel of experts of former U.S. officials about Iran's "sleeper cell" networks in America. Iran, through terrorists affiliated with Hezbollah, could easily launch strikes in America. "They are as good or better at explosive devices than ISIS, they are better at assassinations and developing assassination cells," Michael Pregent, a former intelligence officer who worked to counter Iranian influence in the region, said during the April hearing. "They're better at targeting, better at looking at things," and they can outsource attacks to Hezbollah. This entry was posted in National Security and tagged Iran, Iran Nuclear Deal, Trump Administration. Bookmark the permalink.